You usually don't need a link for the Settings control. You simply configure the User Control in in the module definition as a Settings control and a link is automatically created in the module's menu to navigate to it. If you want to navigate to User Control other than the default controls covered above, you have to perform a few steps. 1) Create the User Control (see my tutorial Super-Simple Module (DAL+) on how to create User Controls). In this example I have created a User Control called EditMyGallery.ascx. 2) Add the User Control to the Module definition and give it a unique key. The unique key I have given this control is mygallery. 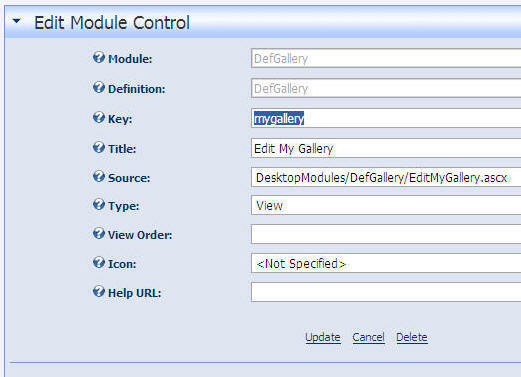 Notice the Module name is DefGallery. This is important and will be used in the next step. The Type has been set to View. In my module I intend for the EditMyGallery.ascx control to be accessible by all users who have access to the View controls. However, realize that the Portal administrator is able to configure the security access for the different types of controls. The Portal administrator usually configures the module to allow all users to access the View controls (even users who have not logged in). However, this is not always the case. The Portal may be a private portal that requires a person to be logged in to use the module. In that case the Portal administrator will configure the View controls for the module to be accessible only by Registered Users. You simply indicate a security group for the control. The Portal administrator will ultimately decide which users actually have access to the control. In the Module definition, you must set the Default Cache Time to 0 (and click the Update Cache Properties button to set it). Otherwise your links may not work properly because of module caching. Inserts tabid/36 into the URL so that the DotNetNuke framework knows which page to go to (in this example we want to go to the current page). inserts mid/362 into the URL so that the DotNetNuke framework knows which module to load.